mission*social is conveniently located in the heart of the SOMA district at 972 Mission Street. It features an open loft layout with hardwood floors, full access to video conference rooms, high-speed Internet, a freight elevator, pool table, and a full kitchen, along with the bevy of other amenities no coworking space should be without. We are currently upgrading mission*social with booths for private phone and internet conferencing, an additional conference room, and new/updated AV equipment in all conference rooms. Information is shared most easily and effectively among office neighbors, even at an Internet company where instant messaging and e-mail are generally preferred to face-to-face discussion. More information and rental options can be found at mission*social. Inveneo has a history of utilizing Ubiquiti products in our broadband deployments, and many Ubiquiti products are Inveneo Certified Solutions. As a Ubiquiti Certified Trainer, Jen joined the Ubiquiti training community and will bring enhanced skills-transfer techniques to Inveneo deployments around the world, increasing the capacity of our local ICIP partners and the ICT ecosystems in which they work. If we are serious about ICT as an accelerant for social and economic development, and we know that a) women are the key to investments in family health and education, and b) broadband connectivity is a major ICT catalyst for both, then we should be working towards a world where every African woman can have access to broadband Internet. But what does “broadband” or “access” really mean? And how can we accelerate connectivity? Yes, mobile operators will play a role, as will ISPs, national backbones, sea cable operators, and the private ICT ecosystem. In fact, its a policy, regulatory, financial, and cultural challenge, which will take many actors working together to achieve impact. How do we start? What advice do you have for the technologists? The technocrats? The ICT4D community as a whole? Or the whole US government foreign assistance framework? 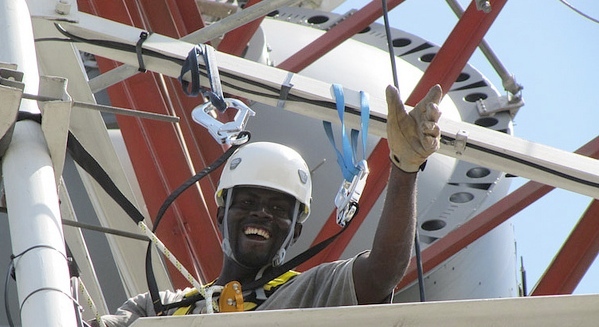 What levers and leverage can make broadband ubiquitous? Come to the next Technology Salon for a lively discussion at the intersection of technology and development, boosted with broadband. We’ll be joined by Priya Jaisinghani of USAID, Ann Mei Chang of State via Google, and your peers – so please RSVP early – we will reach capacity fast. We’ll have hot coffee and Krispe Kreme donuts for a morning rush, but seating is limited at IREX’s headquarters. So RSVP ASAP to be confirmed for attendance – once we reach our 20-person capacity there will be a waitlist. At Inveneo, we like to test new technologies thoroughly before we deploy them in the field, including installing and using them in our offices. In Silicon Valley, this is called “eating your own dog food” and it is a time-honored way to drive innovation that is actually practical and useful. Recently, we heard about Ubiquiti UniFi, which is a WiFi system combining carrier class performance, unlimited scalability, and a virtual management controller all at disruptively low pricing. 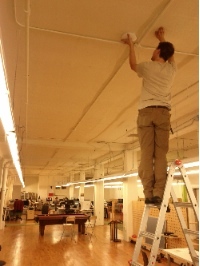 To test it out, we’ve installed 4 Ubiquiti UniFi access points throughout mission*social, the shared workspace for social enterprises organized by Inveneo. There are six social enterprises and countless visitors who work out of mission*social, and Inveneo manages 3 local wifi networks to support them: 1 for Inveneo staff, 1 for mission*social staff, and 1 for visitors. Each of these networks has different bandwidth and security requirements. Previously, we had consumer grade access points where one access point was its own independent wireless network – we had to manage each access point separately and users had to manually switch between networks. With Unifi, each of the four new access points we installed will serve the three wireless networks seamlessly. Users will be able to freely roam from one AP’s coverage area to another, and the UniFi “virtual controller” will make sure the user is always connected to the access point with the strongest coverage. We are still working through a learning curve with the UniFi controller management platform, but the interface is nice, and it allows us to show access point status and coverage overlaid on a floorplan of our office. As an added bonus, installation of the access points was pretty painless, and once installed, they look much more professional than installations we’ve seen done with consumer gear. Best of all, UniFi gives us enterprise-level WiFi at consumer prices. 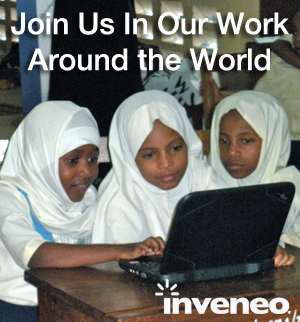 As part of the ICTworks community, Inveneo organized Fail Faire DC 2011 on October 13th at the World Bank. The event was an amazing celebration of failure as a mark of innovation and leadership in ICT interventions. With fun, fast, Ignite-style presentations of professional failures, we had much laughter as we navel-gazed at where we have all gone wrong in mixing technology and international development. Yet we LEARNED from failure. Failure is no reason to be ashamed. Failure shows leadership, innovation, and risk-taking in pushing the boundaries of what is possible in scaling ideas from pilots to global programs. As Slate.com says, there is great value in examining our mistakes as we go beyond the easy and the simple. To be involved in Fail Faire DC 2012, be sure to sign up for alerts on this and other Fail Faire activities.